The concept of teaching comes from the fact that all production lines are basically composed of functionally similar devices. A common theoretical basis is therefore deepened by sectoral disciplines focused on the transfer of momentum, heat and mass and physical chemistry. The building and profiling subjects include hydro, thermal and diffusion separation processes and reactors, and also design subjects deepening knowledge of elasticity and strength and mechanics. 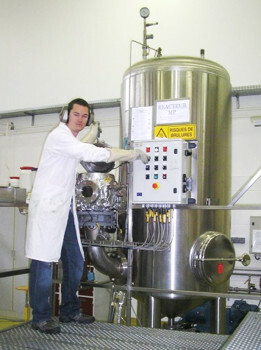 Students therefore first understand the fundamental processes taking place in the apparatuses (transfer of momentum, heat and mass), they get information on designing specific system (pumps, heat exchangers, distillation columns, reactors) and then learn the methodology of integration of machinery and equipment into production lines and further to larger production units. The graduates tackle the topic of designing production lines in a relevant subject and design subjects. An integral part of the curriculum is also the issue of equipment for environmental protection, in subjects focused on wastewater and emissions treatment. Courses in this field have a systematic concept focused on the basic principles of transformation of fabric systems, creation and processing of continuous and discrete objects, on used methods for transformations and adaptations of energy. The acquired theoretical knowledge is then during the study practically used and applied in projects in collaboration with industry. Physical Chemistry, Hydromechanical processes, Heat exchangers, thermal processes, Diffusion separation processes, Reactors and bioreactors, Fundamentals of process engineering, Process engineering, Computer Aided Design, Basics of processing techniques, Numerical analysis of processes, Production lines, Industrial chemicals, Wastewater and gas treatment. Environmental Engineering; Energy Engineering; Transportation, Aeronautical and Handling Technology; Manufacturing and Materials Engineering; Instrumentation and control Engineering.